Find out what cyprus living is really like. Is it easy to get the things you're used to? What about watching your favourite TV programmes? Here's where you can find information dedicated to expat Cyprus life. We're now into our tenth year here in Cyprus and things have changed quite a bit since we arrived. Long gone are the days when you had to ask friends and relatives to bring items you miss over from the UK as you can now get most things on the island, at a price of course. I decided to set up some pages on the key questions people ask about when contemplating a move to Cyprus, focussed on practical issues like where to buy must-have cheddar cheese, how to watch your favourite soaps like Eastenders or where to catch up on live sports events like the Six Nations rugby tournament. In fact, all the key FAQ's on Cyprus living. 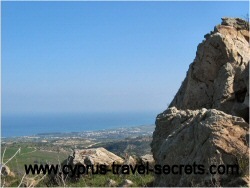 Many people think life in Cyprus is just one long holiday in the sun. Well it may be if you are retired and well-off, but if you are working or on a tight budget as your pension has been squeezed over the years since Cyprus joined the Euro, then it pays to know where to shop for the best bargains. Tip: Lidl has opened a second store in Paphos after the success of the first shop and other stores across the island. It's the cheapest place to go to get your cheddar cheese! All the main towns, including Polis, have a major supermarket for the best value groceries. I can't say they are always the cheapest as some of the small fruit markets and kiosks often sell things at the same price, but you can usually get better deals on bulk purchases like crates of beer, large packs of loo roll or 2 for one offers. There are several bargain basement stores selling items at 2 with lots of products, many direct from the UK. These are always best value for branded items like deodorants, mouthwash, make-up items and moisturisers, although be warned, some products are either out of date or near their sell-by date. I personally use Amazon for a lot of purchases, even sun-tan lotion and Olay moisturiser as it's simply far cheaper, even when you add on the postage cost. One frustration of expat life in the sun and Cyprus loving generally is the difficulty and/or cost of watching favourite UK TV abroad programmes. We don't actually watch much telly, but we are rugby and cycling fanatics and love to see live rugby games like the Six Nations or the Rugby World Cup. We subscribe to the Arabic OSN satellite channel and have a wide choice of programmes including excellent sport coverage. But last summer, the main sports channel showing the Lions games, kept losing the signal, so I searched around for some alternatives and happily found a low-cost solution which you can read more about on my watch UK TV abroad page. It's especially useful if you love your UK soaps and live football, cricket or rugby matches and it's far better than using some of the free live streaming websites, assuming you have a fast enough broadband connection, to watch UK TV abroad which constantly seem to lose the signal just at that important moment in the match! There's no need to use a bank for your international money transfer anymore. I just used Transfer Wise to send money from my UK GBP Sterling account into my Cyprus Euro account. It only took a few minutes to set up and the money arrived in my Cyprus account within 36 hours. I got a great exchange rate and the fee was less than 0.5% of the total amount. Amazing! Tip: If you want to try Transfer Wise, a company you can trust backed by Virgin boss Richard Branson, then you can make a transfer for FREE by using this special FREE MONEY TRANSFER INVITATION. Just found a great way to get cheap international mobile calls here in Cyprus. Just sign up with Local Phone. You can find out more about how it works on my cheap mobile calls page.